When it comes to developing and implementing a marketing strategy the biggest concern for most marketers have is developing content. Marketing content is the info you produce to attract your target audience. It give you the opportunity to present yourself as something more than a salesperson. Many think the content in content marketing is limited to blogs. While blogs are one of the most common and used forms of content, there are other types of content you should be considering. 60% of marketers create at least one piece of content each day. Anything can be considered content because the purpose of content marketing is to educate a select, targeted audience. However, not all forms of content are created equal. Different types of content are more effective for different audiences. Blogs – blogs allow you to improve the SEO on your website by adding more content that can then be indexed by search engines, which makes it easier to find your website via organic searches. Blogs are also the best way to communicate important and instructive information. Audience: People who need to be educated on a certain topic(s) so they feel more confident when purchasing a product or service. If there is a lot of misinformation surrounding your industry or business, a blog can help you educate your target audience. You must be confident that your audience will be willing to take the time to read what you publish, otherwise you can look into other options. Video – Video content is becoming more popular by the day. It allows your audience to digest a lot of information in a short amount of time. It can also be a good way for your audience to become more familiar with you and your brand. Audience: It is hard to say what would NOT apply to every type of audience. According to Hubspot, 72% of people would rather learn about a service or product by watching a video. The only ones for whom a video may not be a good option would be those who have trouble keeping up with technology, or if you believe your product or service would not be well received via video. Webinars – Webinars are a great way to reach a large amount of people without having to leave your desk. You can do a live webinar where people have to check in at a certain time or day. Or you can pre record a webinar and have people download the info. Audience: This is sort of like combining a blog with a video, so again this is best if you feel your audience needs to be educated about what you do. One consideration is how your audience earns their paycheck. If they work a 9-5 job, it would make it tough for them to sit at a computer at a specific time. Instead, you can do a live webinar when they are able to attend or pre record your webinar. eBooks – eBooks work best when you have a lot of information about a topic that would be too long for an individual blog but you would like to be one piece of content. These can also serve as a great way to expand your email list and attract new leads. Audience: Again, this is about educating your audience with content they are willing to read. Additionally, they must be willing to give up their email address so you can send them the eBook. Before you consider this option, make sure you understand the level of commitment you can expect from your audience (and the level of commitment it takes to create an eBook). Infographics – Infographics help you tell a story with a lot of information visually in a relatively small or limited space. You can provide value to your audience without asking them to devote a lot of time. Audience: Like video, this is another form of content that has broad appeal. It can be shared across most platforms and is versatile enough to be used for just about any industry. Images – Images like pictures taken from a smartphones are probably the easiest form of content you can share. It takes seconds to go from idea to publishing. Professional photos or images based on graphic design take more time and money, but are easy to share. Audience: Platforms like Facebook, Instagram, and Snapchat have been made popular because it is easy to scroll through and see many in a short period of time. These platforms are ideal if your audience gets their information from one of the three platforms. Do note that because it is easy to consume so many images so quickly, you can easily become anonymous if you do not find a way to stand out. Podcasts – Podcasts have been around for awhile, and it seems like just about everybody has one. This is not to dissuade you from starting one. Just note there quite a lot of competition out there, so you want to make sure you find a way to stand out. You can also look at being a guest on a podcast to help raise your profile. Audience: Podcasts do not require much commitment because your audience can listen while driving or doing other daily tasks. The primary concern is making sure your audience is aware of podcasting and willing to find and listen to what you have to say. Email Newsletters – Emails are somewhat unique because they are both content and a system to help you deliver other forms of content. You can develop an email marketing strategy to dictate the frequency and purpose of the emails you send. Audience: When sending emails, make sure your audience truly wants to hear from you. As long as you provide value to your audience, they will want to receive your emails and may even begin to look forward to them. 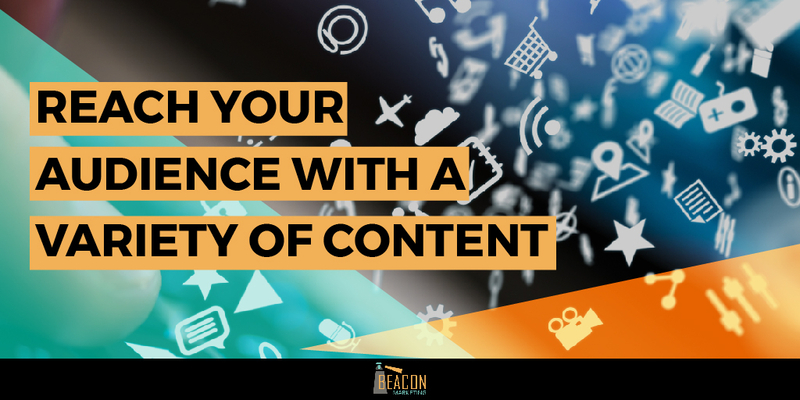 Effective content is content that delivers a specific message for a specific purpose to a specific audience. This is what marketing with intent is all about. Developing a marketing strategy which reflects your business strategy is one of the most effective ways to start developing content that delivers the types of clients you are looking for. We can help you determine what content you should be developing and publishing to attract your best customers. Schedule a FREE consultation today!